Best Electronics Second Generation Upgraded / Improved ST Multi Sync adapter cable. 1. 13+ year proven Best original ST Multi Sync Adapter Cable Design, sold to hundreds and hundreds of Atari ST Users / Owners all over the World. See world wide Atari ST user feed back comments on the original 1st Generation Best ST Multi Sync cable below. 2. New Custom Made extruded wire harness with 2 fully molded in RF Video Interference Suppressing Torrids on the new wire harness, that eliminates the need for the two old style clamp on RF Torrids and the 13+ plastic tie wraps (used to keep the 3 separate 6 ft wire cords on the Best ST Multi cable from becoming a tingled wire mess) that were used on the 1st Generation Best ST Multi Sync adapter cable. The new custom extruded wires (3 cable cords are molded / extruded into a 1 piece solid wire harness assembly) gives the 2nd Generation Best ST Multi sync adapter cable a much Cleaner and Improved look. 3. The second generation Best ST Multi Sync cable is about 27% heavier than the original Best Multi sync ST adapter cable design, because of the Thicker / Beefier gauge internal wires used on the new Custom made extruded wire harness assembly for better reliability. 4. Upgraded / Better Euro style split ring RCA Male ST sound out connector compared to the 1st Generation US style 4 prong RCA Male sound out RCA connector for better reliability. 5. Like the 1st Generation Best ST Multi cable, all of the 2nd generation Best ST Multi sync cable connectors (except the ST Color / Mono switch assembly) are molded onto the wire harness for better strain relief and durability. 6. Best ST Multi Sync adapter cable part number and Best Web site URL address silk screened onto the 2nd Generation extruded wire harness. 2nd Generation Upgraded / Improved / Heaver Best ST Multi Sync adapter cable left picture and original 1st Generation original Best ST Multi ST Adapter cable right picture. Looking for An Atari ST Monitor or Atari adapter cable to use a VGA Tube or LCD / LED Monitor? Find out how you can get 2 ST monitors in 1, using Best Electronics Featured product. 1. On Most Multi Sync Monitors (on the 2 Lists below) you will get Three Atari ST Monitor Screen Resolutions, Low color, Medium color and High Resolution Monochrome on the same monitor! Joe B. of CA. On Joe's second or third order to Best in a row, contacted Best via E-Mail. He said he was considering upgrading his small ST display to a larger one. He asked Best if the NEC Multisync 1970VX 19 inch color Flat panel display was compatiable with the Atari ST Computers. Best told Joe, that the NEC Multisync 1970VX display was on our two large lists of (plug and play) Compatiable ST monitors. So Joe ordered one of Bests 2nd Generation Multi Sync adapter cables. "Surprisingly I got the shipment Friday...super fast since you mailed it Thursday night. The ST cable to the Multisync works great and I'm very happy I finally made the investment to get a good monitor"
Ben G. of WI Ben ordered one of Bests 2nd Generation Atari ST computer Multi Sync adapter cables. "I received my MultiSync cable today and it works wonderfully! Thanks for the super fast shipment!" Kimmo P. of Sweden Kimmo contacted Best, a couple of E-Mails back and forth. He placed on Atari order for one of Bests Custom made 2nd Generation ST Multi Sync adapter cables, a HD 15 gender change for the Best cable, 1 each Best Atari Hong Kong, and Taiwan made STM1 Mouse rebuild kits. "Thank you very much! I received the products yesterday. Excellent quality! But I found another LCD TV that does work in all three resolutions and it is not listed in table of supported monitors on your site. You may want to add it. I have not found the supported horiz. and vertical frequency range in the documentation, but the model is Denver DFT-1904. It has a 19" inch widescreen display. The display cannot be rescaled to 4:3 in PC mode, but it autoscales the picture in a nice way so low res. looks fine anyway." Francois H. of Canada Francois purchased Best's ST Multi Sync adapter cable for his ST computer. After he received it E-Mailed Best again, he was considering getting his old bad Atari SC1224 ST Color monitor fixed as a back up and asked for some information. Best E-Mailed him back with some information on getting his SC1224 monitor repaired in Canada. "Thanks for your help, I think for now I will then stick with the multi sync adapter and Ambry scaler box. Works very well on my old Dell LCD monitor." Lisa C. of Australia This is Lisa's 4th feedback comment to Best. Lisa purchased a reconditioned Atari 1040STE and had it upgraded to 4 meg of memory from Best Electronics about 3 to 4 years ago to replace her ST Midi computer that died. Her latest Atari order was for one of Best's 2nd Gen. ST multi Sync Adapter cables. "I have been meaning to thank you for the cable. It works extremely well and the screen is so much bigger. Thank you for your wonderful customer service"
2. In most cases (but not all), depending on the Multi Sync Monitor screen size you will get a larger Monitor Display (than Stock Atari color ST Monitors) but usually not full screen size in Monochrome mode, with normal outside black border around the monochrome display, like the original Atari SM124 display but just a much larger viewable Monochrome display. 3. Dot Pitch (quality of the Display) on most of the Multi Sync Monitors is usually Better than the Stock Atari ST monitors. Raymond K. of NY Raymond placed an Atari order for one of Bests 2nd Generation ST Multi Sync monitor adapter cables. His Atari order was shipped on a Friday and he received it on Monday. "thank Best ST Multi Sync adapter cable works great so well made. fast shipping too. thank again"
Jan J. of Sweden "Now I have tried the Cable" Best ST Multi Sync adapter cable "together with my Atari Mega4 + Megafile 30. Works great ! and what a big screen ! Now I can start to make music again with Notator." 4. Using a standard Monitor switch box, you could even connect up a second PC based computer and have it work on the same Multi Sync Monitor. 5. Most of the Multi Sync Monitor brands and Models listed below have been around for a little while (also many people have been upgrading to a LCD displays), and can usually be picked up at Bargain Prices at Local Electronic Shops / PC dealers / Swap Meets / Electronic Surplus houses / Electronic Recycling Centers. Alex O. of France Purchased a Reconditioned Atari Stacy 4 and the Best ST Multi Sync adapter cable. "Everything is working nicely and I was even able to use a cheap 32" LCD TV for B&W with the cable and the needed HD15 gender changer. I follow your advice ( turn off the Stacy LCD display ) and use the Best ST Multi Sync adapter cable for an external Stacy mono chrome display. The external display is better and even excellent with brightness off for the Stacy screen anyway"
John D. of CA "I hooked the Mega 2 to a 21 inch Superscan Pro 21 Hitachi monitor and Hi Rez works great. I never thought I would see a Atari screen on a 21 Inch Monitor. Neat cable"
6. Many of the Multi Sync Monitor Brands and Models listed below were shipped all around the world and Set up for each countries different Operating Voltages (110/220/240 Volt). It is a lot cheaper cost wise, to ship the Best Multi Sync ST Monitor Adapter cable across the US or World Wide, than ship a complete ST Monitor. Also there is less of a chance of a shipper damaging a cable assembly compared to a complete boxed heavy ST Monitor. 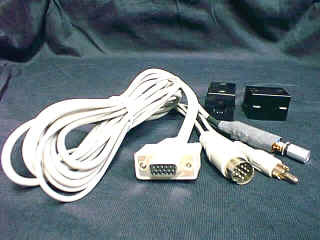 Atari Tech Tip: Before you consider getting the Best ST Multi Sync adapter cable, double check your Multi Sync Monitor, LCD, TFT or Plasma display Cable end or input Video connector to make sure that it is a Male HD-15 connector, so that will mate up with the Best ST Multi Sync adapter cable HD-15 Female output connector. If you do have a Female HD-15 connector on your video display or video display cable, you will need a HD-15 to HD-15 Male to Male gender changer which are in stock. Bill D. of NJ "I received your cable today." One of Bests ST Multi Sync adapter cable to Multi Sync Tube and LCD Monitors, to replace the standard Atari made ST Monitors "I'm very excited for a few reasons, but first I wanted to thank you very much for your speedy ordering and delivery process. But I'm doubly excited, because when I connected this to my Coby LCD TV-TF1514 color TV with VGA inputs, it appears it can natively handle ALL the ST resolutions WITHOUT a converter box! I just plugged the cable in, and figured I could at least test the monochrome part of it, since I know that is basically at the same scan rate as VGA, but to my surprise, I saw color in ST Medium mode, rather than monochrome ST High mode. I tested all three resolutions and they all work!" 7. Atari ST Midi users, looking for Mono chrome replacement Monitor for your Atari SM124 or Atari SM147 dying Monitor? Most of the current Modern Multi Sync tube and LCD / LED Monitors on the Market today will work in ST Mono chrome mode only. Just double check your New Multi Sync Monitor Owners Manual (can also be found on the Internet with a simple search) sync range (typical modern Multi Sync monitor range: Horizontal Frequency 20 - 36 kHz, Typical Vertical range: 50 - 90 Hz) The ST Mono chrome Display requirements: 35.7 kHz Horizontal and 71.2 Hz Vertical Frequency's. Atari Tech Tip: When you 1st connect up your new Best Multi Sync ST adapter cable to your Tube / LCD / LED or Plasma larger display / TV to get an Atari larger Monochrome display, it maybe too dark, too light, or have vertical light and dark lines or strips on it depending on what was factory presets were for Hi Res settings on your Monitor / TV. You can usually correct these ST Hi Res minor display problems by using your display auto correct / adjust / update function. But in a few cases you will get very close to the normal ST Mono chrome display you are use to, you may still have to go into your Monitor / Display set up menu settings and make fine adjustments to your Brightness, Contrast, Clock and Clock phase settings to get a perfect ST Mono chrome display and then save those new display / monitor settings. Gilbert H. of Belgium "Just got hands on the adapter cable," Best ST Multi Sync / LCD monitor adapter cable "it works great with a compatible monitor !" 8. Because most Multi Sync Monitors on the market do not have Audio in and out features, the Best ST Multi Sync monitor adapter cable, includes one RCA male audio out cable, so you can connect this ST audio out cable to an amplified Speaker to hear the normal ST Key clicks and other normal ST program sounds. 9. Compared to the stock Atari made ST SC1224 Color, SM124 Mono Chrome or SM144 Mono Chrome monitors with their very tiny 12 to 14 inch hard to see Diagonal screen size, the Best ST Multi sync adapter cable will allow you to go to much larger 19 to 40+ inch screen displays. Mark W. of the UK "Thanks very much for the cable, it works a charm." Best ST Multi Sync Adapter cable. Follow up question: Do you have a similar cable, but with audio break out? Answer: Already built into the Best ST Multi Sync adapter cable. Follow up Comment: "It was great before I realized it had built in audio out. Now I'm over the moon." 10. If you use the Ambery Scaler box below with the Best ST Multi Sync adapter cable, the Ambery Scaler box will Sync up the Atari ST Low and Medium Custom Color Video non standard Display signals, so you can use most current larger LCD, LED and Plasma screens. The Ambery Scaler box will not pass thru the 71.2 Hz Vertical Frequency's required for ST Mono Chrome display. In most cases to get the ST Mono Chrome display on the same LCD display you are using, you will have to connect the Best ST Multi Sync Adapter cable directly (by passing the Ambery Scaler box) to your VGA tube, LCD / LED display. If you do want to switch back and forth between ST Color and Mono Chrome Displays on the same LCD display with the Ambery Scaler box, you can get a VGA Switch box with extra VGA cables, to switch in and out the Ambery Scaler box to your Tube, LCD / LED display. Remember the push button switch on the Best Multi Sync adapter cable must be in the top position for a Mono Chrome display and bottom position for ST Color Display. Here is the current list of Multi Sync Monitors that will work with the Best Electronics CB102582-6 Custom Made Multi Sync Monitor adapter cable. If by chance you Do Not find a Multi Sync Monitor on the List below you can use or find locally, check the product information below on the Required Multi Sync Monitor Electrical Specifications. If you find another brand or Model that will work on Atari ST computers please let us know and we will add it to the list. New Update. Now you can use just about any of the newer Larger LCD / TFT / Plasma Monitors / LCD TV's / Projection TV's or the largest Tube type of Multi Sync Monitors you can find using the Best ST Multi Sync adapter cable and the Ambery RGB to VGA Scaler Box (around $92 plus shipping). The Ambery Video Scaler box, converts the older Atari ST 15Khz (ST Color modes) Video Signals to the Newer LCD VGA Standards. All you need to due to get all three Atari ST Video Resolutions (Low Color, Medium Color and Monochrome ST displays) on your Large LCD display is connect up the Best ST Multi Sync adapter cable to your ST Computer, then connect up the Best Multi Sync cable HD15 connector up to the Ambery AV-1 Scaler box (HD15 Male to Male Gender changer required) in port (plug in the Scaler box Power supply) and a third Optional HD 15 VGA cable from the AV-1 Scaler box out port to your LCD / TFT Display input connector or use the Ambery AV-1 Scaler Box supplied HD15 to 3 RCA Male Component Video connectors cable. This Ambery Video Scaler box information is provided by Best Electronics for its ST owners. We do not stock this item, but you can order it direct from the Ambery web site. See information below. Atari Tech Tip: If you do get the Ambery Scaler box and want to use it with the Best Multi ST Adapter cable (HD15 Female connector out) with it, you will need at least one HD-15 Male to Male Gender changer to connect up to the Ambery VGA female input connector. You may need a second HD-15 Male to Male gender changer if your output display has a female HD-15 input connector or cable end. We do have HD-15 to HD-15 Male to Male gender changers in stock. For more information on the Video Scaler Box and to order directly from Ambery Web site, click on the above picture. Mark G. of Australia "I've received the Ambery device today and just wanted to send through some feedback that coupled with Best Monitor Cable," Best ST Multi Sync adapter cable "it's a fantastic setup. The picture is crystal clear and if you set the medium rez mode to widescreen it looks much better than on a original monitor!" The information on the Ambery Video Scaler box, was supplied to Best Electronics by Neil T., a very Happy Best ST Multi Sync adapter cable owner with his ST Computer now connected to a 24 Inch LCD Color Display! The Following 1st list is from the Best Electronics Rev. 10 Catalog page 189, "Best Tech Tips". Most of the ST Compatiable Monitors on these two lists below are Tube type of Multi sync monitors, except were noted LCD type of displays. Best ST Monitor Information Tip: Monitor (tube and flat panel) manufactures frequently change the internal chip sets used on Monitor motherboards during the total production run of (early, mid, end of) that monitor without telling anyone or changing the Monitor Model number or part number on that monitor. So it is possible to find a ST Compatiable monitor on these lists and know 10+ other Atari ST Owners who have used the exact same monitor (early production run) model number on their ST computer with no ST compatibility video issues at all. Best has recently removed a few Flat panel ST Compatible monitors, because the monitor manufacture changed monitor motherboard chip sets, sometime during the production run of that model monitor. In most cases the only sure bet is to get the Best 2nd Gen. Multi Sync adapter cable and try it on your Display / Monitor. If you can not get ST low and Medium Color modes, then you will have to get the Ambery sync. box. ACER 7015 ? ? ? Amazing Tech. MS-8431 14 15-36 ? Asus VE225 LCD ? ? ? BenQ G2420HD 24 Inch Color LCD 24 ? ? BenQ BL702A LCD ? ? ? Coby TV-TF1514 LCD Color TV (New Addition to list) 15 ? ? Dell 2002FP LCD 20 ? ? Dell 2001FP (New Addition to list) 20 ? ? Dell U2410F LCD 24 ? ? Dell U2412M LCD 24 ? ? Denver DFT-1904 19 inch wide screen LCD (New Addition to list) 19 ? ? Hitachi Superscan Pro 21 21 ? ? Microvitec Model 2020 20 15-38 ? NEC Technologies NEC 2 ? ? ? NEC Technologies NEC 3D ? ? ? NEC XV29 (XV2940) 29 ? ? NEC 1550M LCD 15 ? ? NEC 1970VX LCD 19 ? ? NEC 1970NX LCD 19 ? ? NEC 1970NL LCD (New Addition to list) 19 ? ? NEC 1990FXP LCD 19 ? ? Samsung CN4551 ? ? ? Toshiba MM20E45 ? ? ?